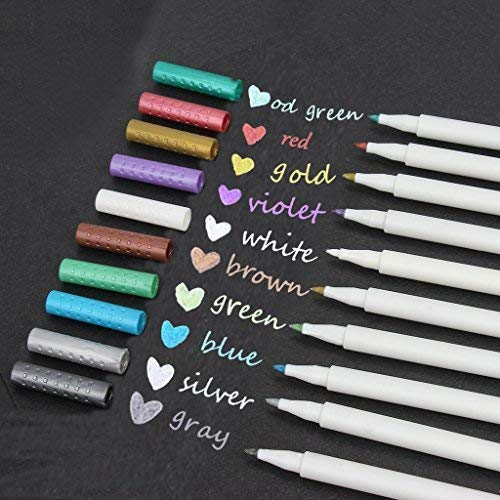 High Quality: Metallic Pens are smooth, soft and kid-friendly design . They are designed to provide you with a delicate yet firm feet, giving you a clear line every time! No Skipping! We provide fast, free shipping. Most items are shipped within 1-2 business days of receiving cleared payment. We ship to Canada. Special Notice for Freight Items: If an item ships via Freight (Truck) Delivery, a valid phone number will be required so that we can contact you to schedule delivery. The item may be delivered with curbside delivery. An adult signature will be required. Please be sure to have available help on hand to assist you with moving the item to the desired location in or outside of your home. Freight items must be inspected upon delivery. In the unlikely event that damaged is observed, you MUST refuse delivery and note the damage on the shipping receipt and send it back via the Freight carrier. Returns will not be accepted on Freight items after they have been delivered, inspected, and the driver has left the premises. We offer a 30-day return/exchange policy for most of our products. You can request a refund if you are dissatisfied for any reason with your product. (Restocking Fee May Apply). Only factory defects are accepted as a reason for a return. In the case of factory defects, if available, we will replace the product for you. When returning an item, it must be in all of the original packagings and include all of the original accessories or items that came with it. The item and package should be in original and perfect condition. You will be required to cover shipping on the return of non-defective items. All returns MUST be done within 30 days of the date of purchase. Please note that we cannot give refunds or replacements after the 30-day limit has expired. When sending in a return, please note that it can take up to 7 business days for the return to be processed. We do our best to process as quickly as possible. We are extremely fair, and in the rare event of something out of the ordinary happening with our products or shipping, we will gladly work with you to find a fair resolution.